British carmaker McLaren’s EV P1 is for three to six-year-olds and goes on sale in October for $486. 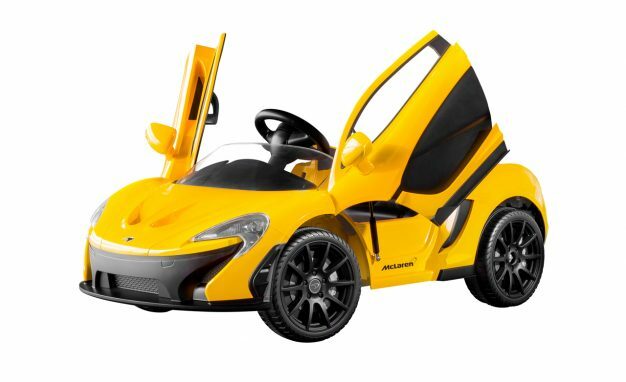 McLaren clearly likes toying with its fans because its newest model is a battery-powered hypercar for kids. The newest edition to the British supercar maker’s range is a full plug-in electric version of its P1 hybrid hypercar. What’s more, unlike the existing version — each example of which has already found a home — this one is an open-top roadster and one that also borrows the legendary McLaren F1’s central driver’s seat setup. Unveiled yesterday at its space-aged UK headquarters alongside its legendary Formula One, Le Mans and road-going cars, the Ride On McLaren P1 is McLaren’s first ever drivable toy car. It will be sold initially as a McLaren dealer network exclusive for $486 starting in late October. Towards the end of 2016 the car will also go on sale at selected retailers. However, for that premium outlay, drivers will get a car that can go from standstill to its top speed (5kph) in three seconds, that boasts three forward and one reverse gear, plus an MP3 player that comes pre-loaded with classic nursery rhymes. The car also features working lights, a push-button start and, while it will only be available in Volcano Yellow, the car will sport McLaren’s trademark dihedral upward opening doors. As for the company’s full-size cars, though work is progressing on an all-electric supercar and even more efficient plug-in hybrid powertrains, the first truly zero-emissions road-going McLaren isn’t expected until 2022.